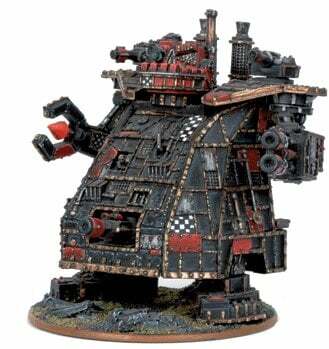 I’m super pumped that the Warhound Titans are now in stores for Adeptus Titanicus. They really round out the game and add that key piece of the Titan puzzle to the mix. Having a fast moving Titan that will force your opponent to deal with them or take the heat from another threat is a really cool addition to the game. But now that they are out, it got me thinking of where GW could take the game from here. I’ve already mentioned this earlier – this game has a lot a room to grow. 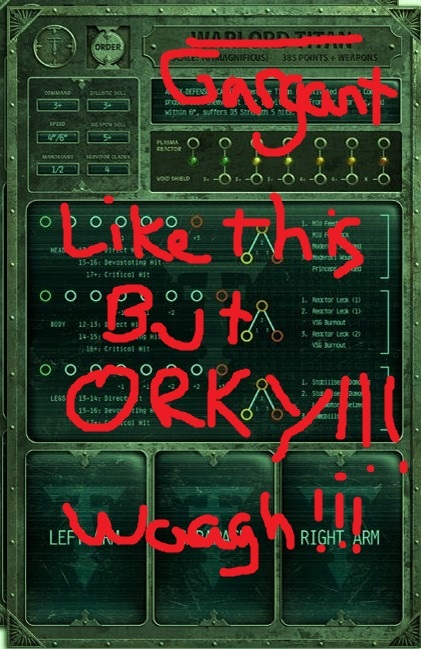 But I think the next logical step is actually an Orky Expansion! 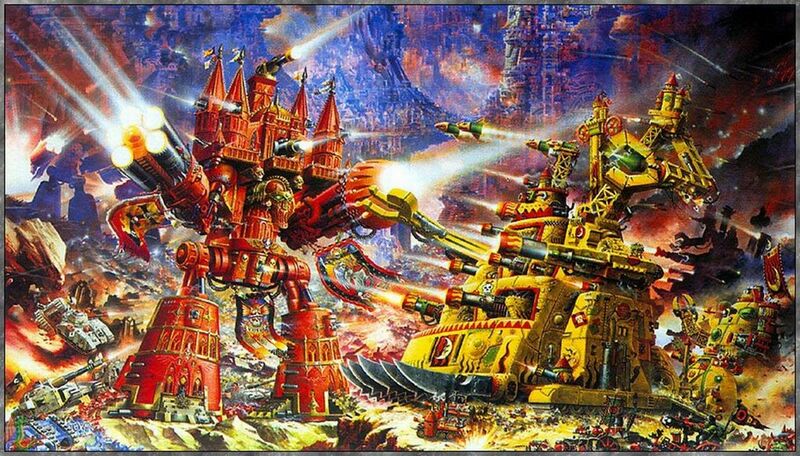 Now I know some folks are probably thinking “Hey, what about Chaos Titans? !” Yes, those would actually be relatively easier to implement to the game. GW laid out the sprues for the Titans in a way that would make creating “Chaosifyed” Titans very doable. However, gameplay wise, you’re not really adding much difference. Sure there are a TON of weapons that could be introduced – but the fundamental play style of a Chaos Titan is going to be very similar to an Imperial version. But Orks could be VERY different – but still have some parallels. There are also the Morka/Gorkanauts that could be a part of the Ork faction for the game. And to be honest, we probably don’t need all 6 of these Gargants at the start. If we are to mirror the Titans release, we should pick 4 as a solid foundation. To do that, I think our best bet is to compare their relative Power Levels based on their 40k counterparts. Is this an exact science? No, but it’s the only current game system we have and they are relatively balanced – so it’s better than going in blind. These relatively new plastic kits clock in at 18/19 power level – that puts them slightly below a Knight. I think that’s a good fit for the “points fill” unit like Knight Banners. They should probably come in squadrons of 3-4 and would make for a good parallel to Knights. 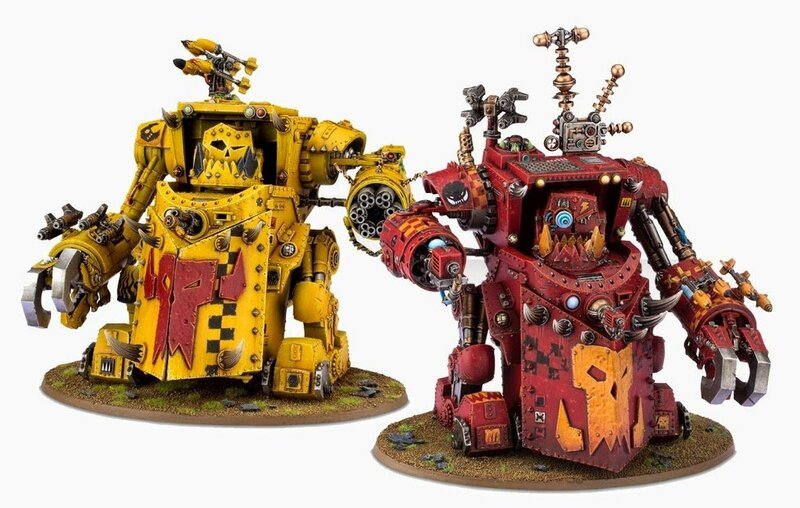 Ork Stompas have a Power Level of 49 – that puts them at roughly 2/3 the price of a Warhound Scout Titan. If they filled a similar role as the fast outflanker but were a little weaker and cheaper, I think they could be a great fit. 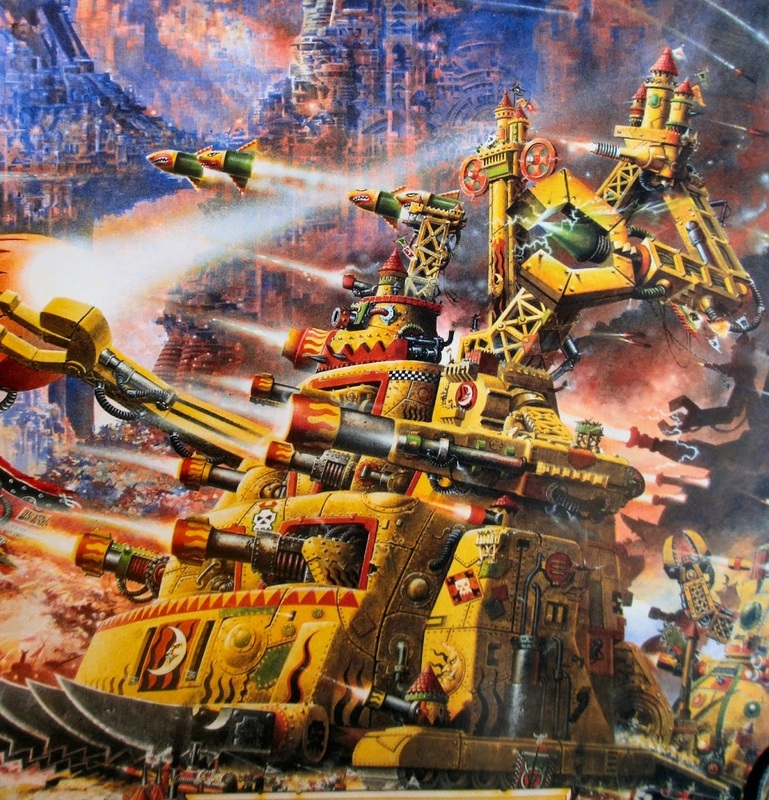 Plus I’d love to see 3 Stompas take on 2 Warhounds – if that was a pretty even fight I think we’d be in the right ballpark! Naturally, we had to have the Gargant in the mix! Unfortunately, we don’t have a Power Level cost associated with a Gargant. 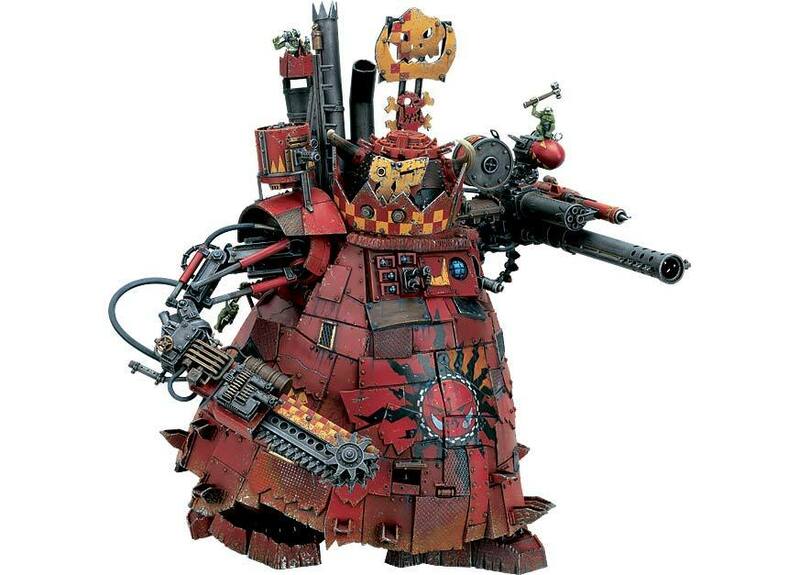 But if we use a similar ratio of Stompa:Warhound, I think we can figure this one out. Gargants should be roughly equal to a Reaver in terms of class, but using our ratio, that means they should 2/3 of a Reaver. 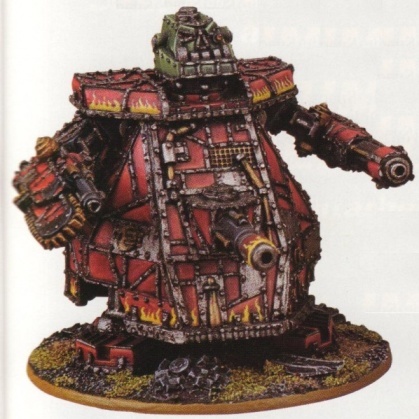 If a Stompa was balanced at approximately 80 Power Level in 40k, then we could extrapolate that out in Adeptus Titanicus. 3 Gargants for ever 2 Reavers seems about right. And finally we have the Great Gargant – this would be the 2/3rd equivalent to the Warlord. In essence this would probably also make them the “Main Battle Gargant” as they would be slight more expensive in points/power than a Reaver, but less than a Warlord – which is where we want them to be. Having the Orks be somewhat “staggered” in Power Level/Performance level also creates some interesting army differences. You’ve got the possibility of a “swarm” but you’ve also got the option of some pretty big hitters in the mix. But more importantly we’ve got parallels but not direct copies – this makes the faction play differently without drastically altering the core game.